Proprietary blend of all natural Essential Oils proven to assist in calming, focusing and a restful sleep combined in a spray for your child. Shark Power Spray assists in easing your child's fears while providing them with a feeling of courage, strength empowerment and self-love. Kit includes 1 bottle of Shark Power Spray that can be sprayed on the body, in the air, under the bed, in the closet on linens, toys or anywhere. 1 Shark Power story featuring Finnegan the Shark. BONUS – special access to additional interactive information so that you can help your child grow in self-confidence! 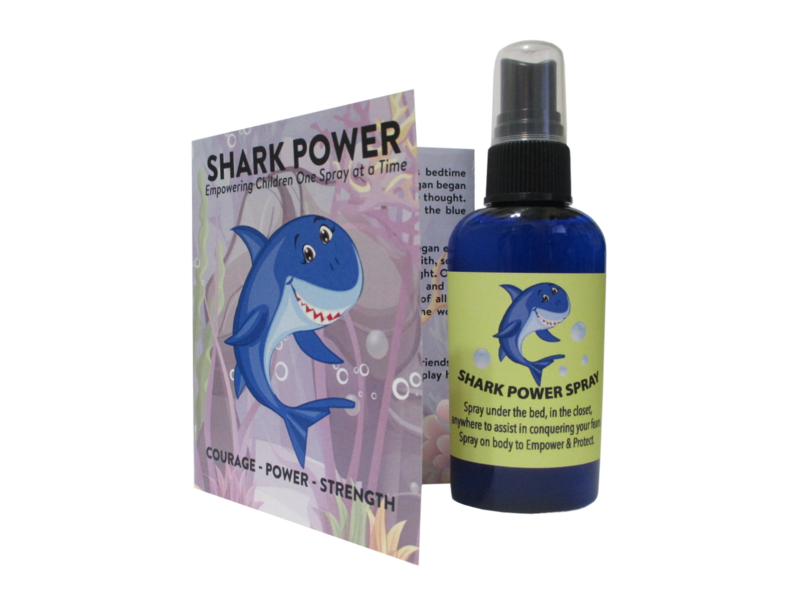 Shark Power Spray – Kid’s Empowerment Kit: Distilled Water, Polysorbate 20, Glycerin. Lavender, Sweet Orange, Ylang Ylang, Sage Essential Oils 2 oz. CAUTION: Use with parental supervision , avoid contact with eyes, do not ingest. If pregnant or nursing check with healthcare professional before using.